Many Devoran men served in the Merchant Navy during both wars. some of them sadly died on active service. Devoran men like G.F. Crocker died with Merchant Navy in WW1. T.H. Kemp and W.C. Nicholls were also lost at sea in WW2. 3rd September is of course also the anniversary of war being declared on 3rd September 1939. Remembering the men and women of the Merchant Navy past and present on Merchant Navy Day 3rd September. Hooray for the Red Duster! Blog posted by Mark Norris, Devoran War Memorial Project, 3rd September 2018. This entry was posted in Cornwall, Devoran, Merchant Navy, war memorial, WW1, WW2 and tagged MerchantNavyDay, WW100 on September 3, 2018 by worldwarzoogardener1939. William Thomas Ball Peters of Carnon Downs, who served with the RFC Kite Balloon Section and the Sherwood Foresters died of wounds in France on 27 August 1918. Private William Thomas Ball Peters, 72511, 10th Battalion, Sherwood Forestrs (Notts and Derby Regiment) died of wounds aged 26 on 27th August 1918. Peters is buried in grave B24, Fienvillers British Cemetery, Somme, France. This small cemetery of 124 burials was made by the 38th and 34th Casualty Clearing Station, Fienvillers between May and September 1918. Before his transfer to the ‘Sherwood Foresters’, according to his surviving army service records, W.T.B. Peters (resident in 1914/5 in Shulock Road, Hampstead as a Milk Carrier) had a strange wartime career in the early Royal Flying Corps as 12357, Kite Balloon Section, RFC. Kite Balloons were a tethered balloon for two observers, maintained by a large ground team – see the kite balloon entry in the Mary Evans picture library blog. He joined on 11 / 12 November 1915 at South Farnborough and served in the RFC until 8 March 1916 when he was transferred into the Army in France. His RFC training in December 1915 was at Hare Park Camp, Curragh in Ireland, an RFC training depot. Born in Perranwell, Cornwall in 1893, Peters was the only son of Thomas (b.1864) and Mary Annie Peters (nee Davey, b.1867) of Ash Tree Cottage, Carnon Downs, Cornwall. Thomas his father was listed on the 1911 census as an egg merchant and farmer. Obviously a family business, for William his son is an 18 year old Assistant in Wholesale Egg Merchant ‘looking after warehouse’ in 1911, living in Gospel Oak, NW London. Dora Annie Peters (born Feock, 14 March 1899 – died Truro, March 1973). She married Leslie R.J. Hannam (b. 1891- ) in 1918. His other sister, Ida Mary Peters was born c. 1907/8 in Hampstead when the family were working in or visiting London. William Thomas Ball Peters – Remembered. This entry was posted in Cornwall, Devoran, war memorial, WW1 and tagged Kite Balloons, RFC, Sherwood Foresters, William Thomas Ball Peters, WTB Peters, WW100 on August 27, 2018 by worldwarzoogardener1939. 883217, 31st Battalion Canadian Infantry (Manitoba Regiment) died aged 39 on 27 May 1918 of war wounds. One name that crops up on a CWGC search under the name ‘Devoran’ is Edgar Francis Medley but his connection appears at the moment quite slim but interesting – involving family connections of forgotten Canadian war graves, emigration, Red Cross Orderly Reverends and Conscientious Objection by the “conchie” brother of a British prime minister. He graduated from Oxford Wadham College and his Oxford memorial records that he died in Canada of wounds received in France and Belgium in 1917. He married in 1905 in Banff, Canada where he seems to have spent most of his life working as a farmer in the Red Deer District, Innisfail, Alberta, Canada having emigrated in 1903 or 1905. He is listed as the husband of Louise Maude Medley, living in Innisfail, Alberta, who was also British born. They had two daughters Catherine (Kitty) and Eileen. He was remembered at Remembrance commemorations in 2014 in Innisfail, Canada by his community and descendants. This Newspaper article suggest that he has a refurbished or CWGC headstone, and that his once forgotten grave is now on private land. “In 2014, a Veterans headstone marker was placed on land just east of Innisfail in memory of Lance Cpl. Edgar Medley who died in 1918 as a result from his war wounds. After nearly 100 years, a permanent memorial was dedicated to his memory. Funded by the Commonwealth War Grave Commission, this was achieved through many hours of devoted work by locals David Hoar, Don Chalack and Johnnie Bachusky.” . Last weekend, hours before the season’s first big snowstorm hit, I took a small road trip southeast of Innisfail to look at a once abandoned gravesite, one that had been largely forgotten for nine decades. This tranquil spot, in a small forest overlooking a creek valley, is the final resting place of Lance-Cpl. Edgar Medley. Once a prominent citizen who was a vice-president of the Innisfail Agriculture Society, Medley joined the Canadian Expeditionary Force’s 31st Battalion in the First World War. He was a decorated soldier and badly wounded in combat while serving with the army in France. Medley came home but died from his wounds on May 27, 1918. He left behind his wife Maude and daughters Catherine and Eileen. His gravesite, the only one at the isolated location, is commemorated with a huge ornate headstone. Maude died in 1970 and her ashes were spread at the site. The property, meanwhile, changed hands many times. It is possible some of the owners over the years never knew about the gravesite. Certainly, the Canadian government did not know, nor did the Commonwealth War Graves Commission, an organization created by Royal Charter after the First World War to ensure worthy veterans were and still are properly commemorated. What is Edgar Francis Medley’s Connection to Devoran? 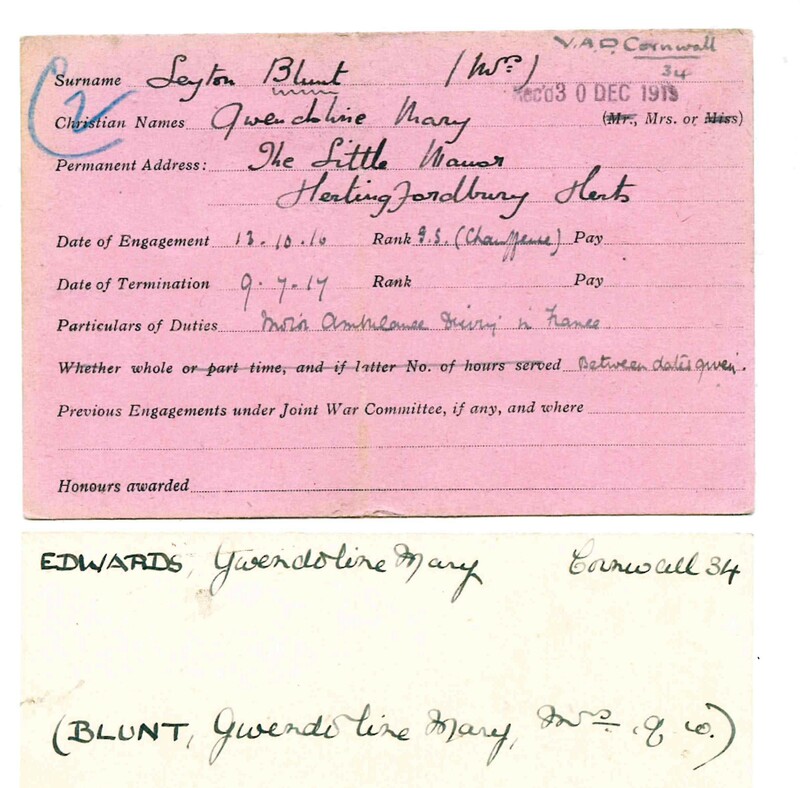 The slim but very interesting Devoran connection on the CWGC website appears to be his mother Mrs Gifford Johnson of Devoran. Although he was born in Britain, her son Edgar’s name is not recorded on the Devoran memorial as he has his own burial headstone in Canada. He is also remembered on the Oxford University Roll of Honour. Edgar’s mother was born Katherine Frances Sinclair Scott in Malta, daughter of Robert C. Scott, an RN Naval Surgeon. The possible Devoran connection may lie here. Edgar Francis Medley had a sister Katherine Mary Ida Medley, who later married architect and WW1 Conscientious objector T.S. (Thomas Simons) Attlee, the brother of British Prime Minister Clement Attlee. Tom Attlee (1880-1960) moved to the relative obscurity of Perranwell, Cornwall in 1919 on discharge from jail as a “conchie” or C.O, living at Tullimaar and Leory Croft Perranwell near Devoran. Katherine’s decision (after her husbands Gifford’s death in 1921) to move to Devoran appears to be linked to her daughter and son-in-law living there. One of Edgar and Kathleen Medley’s decorated military uncles, WW1 Brigadier General Royal Garrison Artillery Alexander Francis Sinclair Scott. As a widow of F.W. Medley (Edgar’s father) Mrs Gifford Johnson had remarried in 1898, the Reverend Gifford Henry Johnson (1859-1921). They had a son around 1900, Raymond Sinclair Johnson who enlisted in the Indian / British Army and became a Brigadier General and MBE, dying in 1988. The Gifford Johnsons lived variously in Richmond, Worthing (1901) and Waltham Essex (1911 Census), still as lodgers no doubt as a Reverend of clerk in holy orders. Edgar’s stepfather, Reverend Gifford Henry Johnson served as a Red Cross Orderly in France 19/4/15 to 16/1/16, Salonica from 17/1/16 to 15/12/16 and France agin from 5/2/17 to 3/4/18. He appears to have received an MBE at some point. He died in Croydon in 1921. Edgar Frances Medley and family – Remembered 100 years on, Canada and Devoran. This entry was posted in Cornwall, Devoran, war memorial, WW1 and tagged Canadian Infantry, Edgar Frances Medley, Mrs Gifford Johnson, WW100 on May 27, 2018 by worldwarzoogardener1939.